Tuesday Treats: Keeping thread clippers safe. I have never been a fan of snips / thread clippers / shearers, that is until I was given this pair. Their clipping action is very smooth so they rapidly became my handy, “go to” cutters for all my stitching. But they had one BIG flaw ….. they didn’t feel safe in my carry around project kit. I was always worried that I would stab myself or, even worse, accidentally cut my current project ….a disaster waiting to happen. The solution was a “five minute”job …. well half an hour if I am truthful. This is the perfect project to use some “found” materials so look around the house for some sturdy fabric. The measurements will depend upon the size of the snips. Add 3/4″ (2cm” ) to the length & 1/2″ (1.5cm) to the width, for the seam allowances & top hem. Embroider your chosen design down the length of the tongue/tab fabric. Position the line of embroidery so that it will finish on the right side, in the middle of one half of the tab when it is a finished tube. I used Cotton Mako’ 50 and chose a pattern that had a semi-solid appearance so that it would stand out like a braid. Next turn the raw edges on the top edge under twice, to the wrong side, to make a hem. Stitch into place. Stitch the tongue/tab in place over the hem, on the wrong side, and in the centre of one of the bag rectangles. Stitch the Velcro into place. 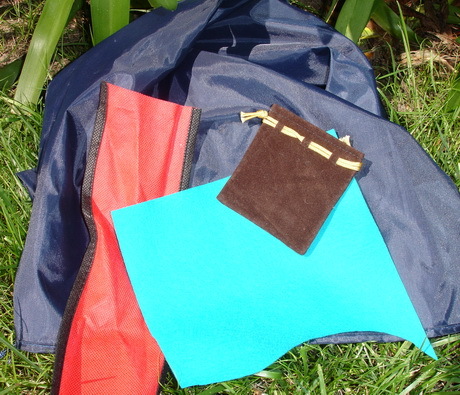 Put the “velvet” on the under side of the tongue/tab and the “hooks” on the right side of the opposite bag rectangle. Make sure that the velcro positions pull the tab down firmly over the top of the bag. Now finish making the bag. Place the bag pieces right sides together and stitch down the long edge, and across the bottom edge using a 1/4″ (6mm) seam. Turn the bag out to the right side, pulling the corners out square. 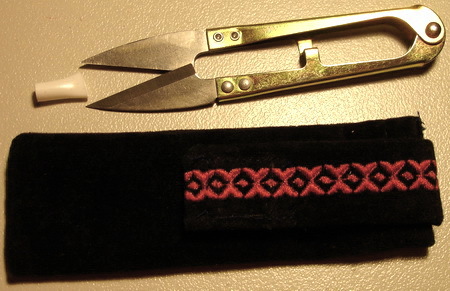 Put a small piece of tubing over the pointy ends of the clippers & insert into their new scabbard. I’ve used the finest of the Cotton Mako’ thread range to stitch the embroidery. 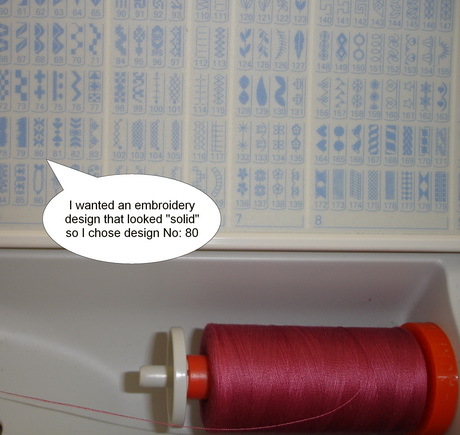 If you use one of the thicker threads, choose a more open embroidery design.